Southern Jeep! Lift Kit! Oversized Tires! Leather! Painted Hardtop! NAV! Custom Bumpers! Spare Kit! Just try and find another one like this! TX/Southern-owned since new, this striking Sahara boasts tons of extras like a painted hardtop, leather, navigation, custom bumpers, lift kit, and so much more sure to turn heads! Start your adventure with a powerful 3.8l V6 with 202hp and 240lb-ft on tap for commanding acceleration out on the open road. 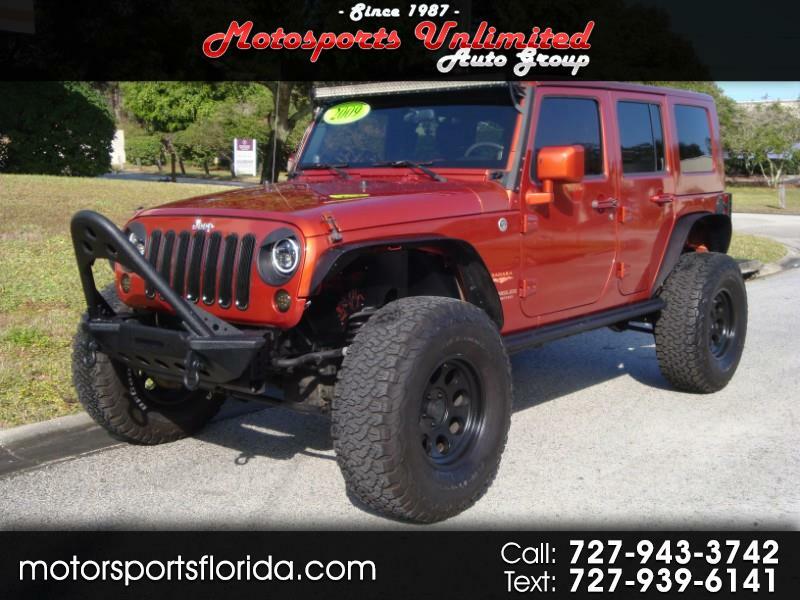 Paired with a stout 4-speed automatic, this Wrangler shifts responsively and returns 20MPG highway! Command-Trac part-time 4-wheel drive offers hi- and lo-ranges for uncompromised offroad capability regardless of the terrain. Equipped to tow, this Wrangler can tote along up to 3500lbs as well! A wide-opening rear swing-gate allows easily loading of the spacious cargo hold while split-folding seatbacks allow even bulky items to be carried inside without a problem. With seats upright, five enjoy the ride on plush leather upholstery with sunburst inserts with dual buckets up front featuring dual recliners, a driver's height adjuster, and lockable glovebox and center console with storage and cupholders. A host of amenities include ice-cold A/C, a 6-speaker JENSEN AM/FM/CD stereo w/AUX input, Bluetooth, and touchscreen navigation, power windows, power door locks, remote keyless entry, driver info center, cruise control, variable-speed wipers, rear wiper/defroster, Freedom Top w/removable panels, color-keyed interior trim, and more! Safety is ensured with 4-wheel antilock disc brakes w/panic assist, dual front-impact airbags, traction control, and stability control. With 17" black alloys wrapped in BFG T/As, a 4" lift kit, custom metal flares, stinger front bumper, LED lightbar, custom metal rear bumper with swing-away spare carrier, LED halo headlamps, metal fender splash shields, color-keyed trim, this Sahara is truly like none other around. Carrying a clean title and good CARFAX, this one is ready to impress. Drive it home today!----Call or text Brian at 727-226-3097 for more info, photos, or to schedule a test drive today!